Nvidia introduced one-click overclocking with the launch of the GeForce RTX 20-series cards in September. 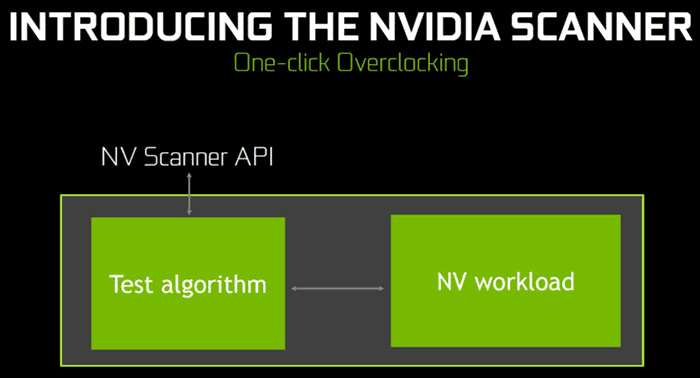 The feature, dubbed OC Scanner, debuted in contemporaneous overclocking utilities such as MSI Afterburner and EVGA Precision X1 was a platform exclusive for Turing GPU-based graphics cards at launch. Now, the feature looks like it is starting to roll out to Pascal-based (GTX 10-series) graphics cards, initially via the latest version of MSI’s Afterburner (beta) and hopefully followed up by a final release and other overclocking tools. If you want some background reading on OC Scanner, it is worth a look at the link above, which will take you to MSI'[s blog post from November. It headlines with the tease that you can "Get a free performance boost with Afterburner OC Scanner" via the utility. We are reminded that overclocking can be daunting to the inexperienced. Thus the one-click OC Scanner facility, running an arithmetic-based routine that evaluates the graphics card at various voltages and frequencies, testing stability along the way, is good for those without GPU OC experience or simply want some OC inspiration without perspiration. For an example of how the OC Scanner functionality worked at HEXUS labs on the EVGA GeForce RTX 2080 XC Ultra Gaming, please check out our linked review. Back to the MSI Afterburner news - and if you want to be able to use OC Scanner on a GTX 10-series card you will have to download the newest MSI Afterburner (Version 4.6.0 Beta 10). Currently at the official site the PC downloads are for Beta 9, but other repositories, such as Guru3D, have the Beta 10 available. Incidentally, Guru3D has also shared the full Beta 10 release notes on its blog post about the release. In the release notes you will see that OC Scanner for the GTX 10-series is confirmed and not some kind of error or programming glitch or oversight. "New bundled MSI Overclocking Scanner application in now included in MSI Afterburner distributive: MSI Overclocking Scanner is currently supported on Nvidia GTX 10x0 and Nvidia RTX 20x0 series graphics cards under 64-bit operating systems only. On such systems you may activate the scanner with dedicated button from the main application window or directly from voltage/frequency curve editor window." The utility download is approx 40MB. Remember, beta software will have various bugs. Lastly, if you use the OC Scanner functionality in MSI Afterburner, it will only tweak and test your GPU clocks. MSI suggests you can apply other manual tweaks in Afterburner to OC your graphics memory to achieve "additional performance".